'Hope for Haiti Now: A Global Benefit for Earthquake Relief' this Friday will feature performances by Wyclef Jean, Bruce Springsteen, Jennifer Hudson, Mary J. Blige, Shakira, and Sting in New York City; Alicia Keys, Christina Aguilera, Dave Matthews, John Legend, Justin Timberlake, Stevie Wonder, Taylor Swift and a group performance by Keith Urban, Kid Rock, and Sheryl Crow in Los Angeles; and Coldplay, and a group performance by Bono, The Edge, Jay-Z, and Rihanna in London. You can watch it live on MTV and also on YouTube along with other sites and channels listed below. All musical performances will be available through Apple's iTunes Store beginning Saturday, January 23, with all proceeds benefiting Haiti relief funds managed by 'Hope for Haiti Now' charities. YOU CAN PRE-ORDER THE LIVE PERFORMANCE ALBUM NOW. 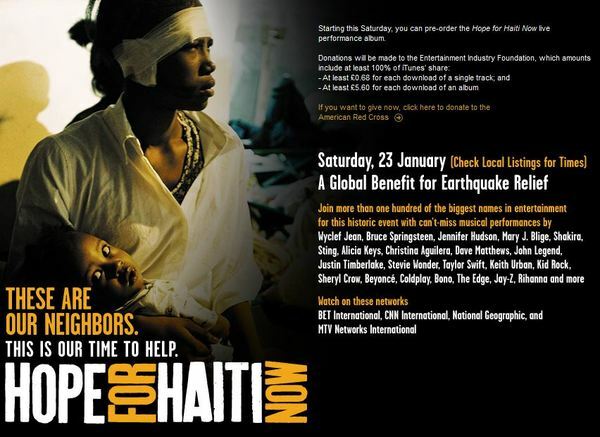 In addition to musical performances, Wyclef Jean in New York City, George Clooney in Los Angeles, and CNN's Anderson Cooper reporting from Haiti, 'Hope for Haiti Now' will feature more than one hundred of the biggest names in film, television, and music supporting the cause with testimonials and by answering phones during the telethon. The Clinton Bush Haiti Fund and United Nations World Food Programme have joined the list of relief organizations that will benefit from 'Hope for Haiti Now,' which also includes Oxfam America, Partners in Health, the Red Cross, UNICEF, and Yele Haiti Foundation. Proceeds from 'Hope for Haiti Now' will be split evenly among each organization's individual funds for Haiti earthquake relief. The two-hour telethon will air on ABC, CBS, NBC, FOX, CNN, BET, The CW, HBO, MTV, VH1, and CMT on Friday, January 22, 2010 at 8:00 p.m. ET/PT and 7:00 p.m. CT. 'Hope for Haiti Now' will also air on PBS, TNT, Showtime, COMEDY CENTRAL, Bravo, E! Entertainment, National Geographic Channel, Oxygen, G4, CENTRIC, Current TV, Fuse, MLB Network, EPIX, Palladia, SoapNet, Style, Discovery Health, Planet Green, and Canadian networks including CBC Television, CTV, Global Television, and MuchMusic. The event will be live streamed online across sites including YouTube, Hulu, MySpace, Fancast, AOL, MSN.com, Yahoo, Bing.com, BET.com, CNN.com, MTV.com, VH1.com, and Rhapsody and on mobile via Alltel, AT&T, Sprint, Verizon, and FloTV. 'Hope for Haiti Now' will also air internationally on BET International, CNN International, National Geographic, and MTV Networks International. 'Hope for Haiti Now' will be the first U.S.-based telethon airing on MTV in China. Facebook and Twitter have signed on as official social media partners to help drive donations and tune-in to the telethon. human's get a bad rap from time to time, but when devastation hits we pull together at record speed. last i heard here in America alone we've raised over 355 million dollars, and that's before the benefit concert tonight. George and his family have always been some of the most generous people from my area, hearing that he was doing this didn't surprise me at all. to all of the relief workers, doctors, search and rescue, military, anyone donating or raising money and anyone else involved or on the ground thank you. you're all amazing. I just knew somehow U2,even if just Bono and Edge, would lend their efforts to helping Haiti in someway. Not shocked by any of the other artists listed for this live event either. The artists listed are the same ones you always see helping out when tragedy strikes humanity. Can't wait to see this concert and will be buying the live CD for sure. The more we are, the more we are one. IT MAKES ME PROUD TO BE A SUPPORTER OF HUMAN MANKIND WHEN THE WORLD COMES TOGETHER AS ONE. IT IS SUCH A BLESSING TO SEE THE RICH AND THE POOR SEE THE WORLD THROUGH THE SAME EYES. MY PRAYERS ARE FOR ALL THOSE THAT ARE SUFFERING, NOT ONLY IN HAITI BUT THROUGHOUT THE WHOLE WORLD. MY HOPE IS THIS WILL UNITE US AND LET US RECOGNIZE ALL THE SUFFERING. God Bless you! You have our support from Croatia and Croatian people! It is great to know that so many citizens of the world are committed to help Haiti. Hope for the future and better health care appears to be a universal idea. Wouldn't this world be a better place if we always had this spirit of generosity and goodwill to all of mankind. If we can come together to help Haiti, I truly feel a tremendous HOPE for our future as human beings. God bless you. The silver lining of this devastating earthquake is to see the world come together in the name of the human race. All over the globe people are talking of hope instead of war. So proud my heros: Bono, The Edge and Bill Clinton have taken such an active role in the relief plan! My heart goes out to the people of Haiti... It's So Stellar Large to pay it forward... Such a massive Global media effort with so many Stars shining... Bono and Edge you Rock...Tuning in and Dialing up for sure... Peace out : ).